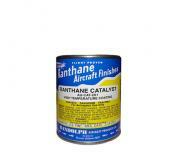 Use: Ranthane is a high-solids, flexible two-part polyurethane that is FAA approved for use on Ceconite fabric. Other polyurethanes are not approved on the Ceconite STC.Although extremely flexible, Ranthane is also optimized for use on primed aluminum, steel, or composite surfaces. Ranthane is offered in 50 colors as presented on Randolph Color Card 2004. Ranthane has three separately packaged components that are mixed before application. All three components are required and cannot be substituted: Ranthane polyurethane paint, AU-2X1 Catalyst, and G-4200 Ranthane Thinner.